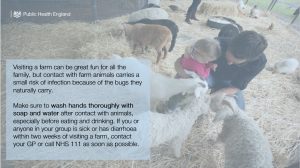 Ahead of the petting farm season, PHE North West is reminding people, especially those with responsibility for young children, to enjoy their farm visits safely by ensuring good hand hygiene after touching farm animals or their surroundings. Angela Hardman, Deputy Director Health Protection PHE North West, said: “Visiting a farm can be great fun for all the family, but contact with farm animals carries a risk of infection because of the bugs they naturally carry. Visiting a farm or petting zoo is an enjoyable and educational experience for many people. However, animals can carry a number of infections that may be harmful to people, especially children and pregnant women. People who visit farms and come in to contact with animals should be aware of the potential for infections from animals. It should be assumed that all farm animals will be carrying infections, even if they appear clean and healthy. Outbreaks of infections associated with animals tend to happen in the spring linked to lambing events and also during the summer when people are on holiday. If you’re planning a school or group visit to a farm, you also need to make sure that you’ve considered all the risks and taken steps to manage them.